Compassionate, attentive legal representation when it’s needed most. Two farmers received a total of almost $40 million from a Portland, Oregon jury after their nursery crops, including blueberry, rhododendron and Japanese maple plants, were destroyed by a faulty fertilizer. Woodburn Fertilizer Company and Sun Gro Horticulture recklessly mixed ingredients into its fertilizer and created an untested blend in an attempt to undercut Scotts "Osmocote Plus." The settlement helped the Yuckerts make changes in their home and lives to accommodate Toni's disability. As people age prescription drugs often play a vital role in helping them maintain optimum health. 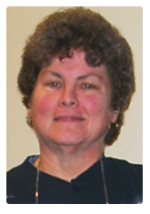 Toni Yuckert, relied on Vioxx to alleviate arthritis pain and counted on the medication to allow her to enjoy life to the fullest. Like many others, Yuckert trusted her physician to ensure that her prescription was suited for her. Unfortunately, her doctor made a critical mistake and took away much of Yuckert’s freedom. A devoted mother and grandmother, Yuckert was an administrative assistant for the Parkrose School District in northeast Portland. After returning from a vacation to China with her husband Mike, Yuckert suffered a serious stroke. The stroke left her partially paralyzed on her right side and unable to speak more than a few words. At the time, Yuckert was taking 100mg of Vioxx per day at the recommendation of her doctor. However, the maximum recommended dosage of Vioxx was only 25mg a day. Rare exceptions allowed up to 50mg a day. We now know that Vioxx was a major contributor to heart attacks and strokes for many unsuspecting Americans. Although Merck – the manufacturer of Vioxx – was able to conceal these risks for many years, Vioxx was eventually pulled from the market. Another attorney referred Mike Yuckert to Lawrence Baron. When the Yuckerts first approached Baron, they were focused on holding Merck accountable. Vioxx had recently been recalled and it was obvious that the medication contributed to Toni’s stroke. However, as Baron studied Mrs. Yuckert’s medical records, her physician’s level of carelessness also became obvious. In addition to arthritis, she suffered from high blood pressure. In fact, that was what made Vioxx so dangerous for her. Vioxx actually contributes to high blood pressure. Although her physician, Dr. Dejan Dordevich, prescribed blood pressure medication, it was countermanded by the abnormally high level of Vioxx he prescribed. Dr. Dordevich also failed to monitor Yuckert’s blood pressure appropriately. Rarely did he even take her blood pressure – a standard practice when caring for patients with high blood pressure. On the few occasions when Yuckert’s blood pressure readings were taken, they were dangerously elevated and no effort was made to address the problem. Baron and the Yuckerts decided to file a claim against Dr. Dordevich. The settlement helped the Yuckerts make changes in their home and lives to accommodate Toni’s disability. "As we got close to the trial date, I was really scared," Brainerd recalls. "But Lawrence demonstrated this quiet determination. He helped me get through with his sense of assuredness and confidence." Portland resident Norma Brainerd (then Swanson) purchased a 1994 Nissan Altima specifically because it featured a passenger side air bag. She felt that feature would help make her and her children safer. At the time, there had been little in the news about air bags posing a risk. In December 1995 — just three nights before Christmas — Brainerd was the passenger in her Altima when the driver misjudged a turn and ran over an eight inch curb. The impact was minor, but the vehicle's air bags deployed and Brainerd was forcefully struck in the face. She was properly seat-belted and had her seat halfway back in the seat track. The air bag broke her nose, gave her a concussion and left her blind for six weeks. She regained the sight in her right eye but is legally blind in her left. Following the accident, Brainerd began looking for an attorney to hold Nissan accountable for her injuries. "It wasn't just for me. I wanted to get those cars off the road." A friend led her to Lawrence Baron. "I was impressed with his determination," she says. "He really did a good job all the way to court. He dug into it and kept unearthing more and more cases where the same thing had happened to other people." In his research for the case, Baron found evidence that the Altima's air bag had been designed to strike the occupant while still inflating. It flew out at the occupant at a speed of 159 miles per hour. All this was contrary to a basic premise of air bag design — that a bag be fully inflated before the occupant falls into it. Baron discovered over 20 other women and children who had sustained serious eye injuries in accidents involving 1994 and 1995 Nissan Altimas. He also learned that while the driver side air bag had tethers, the passenger side did not. Tethers are straps inside the bag that prevent it from traveling too far back into the vehicle. He learned statistically that air bags were not needed in low impact collisions. In November 1998, Brainerd's case proceeded to a jury trial in U.S. District Court in Portland. "As we got close to the trial date, I was really scared," Brainerd recalls. "But Lawrence demonstrated this quiet determination. He helped me get through with his sense of assuredness and confidence." The trial began but on the third day the case settled. Brainerd remained frustrated the cars were still on the road and other people stood a chance of getting hurt. In August 2002, Brainerd and her husband traveled to Washington, DC to participate in a Public Citizen news conference calling for the recall of 1994 and 1995 Altimas. "In the years since my accident, numerous other people have been injured by this same air bag," she told reporters. "Nissan remains aware of the defective product but has done nothing to recall and replace it. How many defective air bags will unexpectedly take the precious vision of other innocent victims before Nissan recalls this air bag?" On April 24, 2003, Nissan finally announced a program to recall the Altimas and replace their defective device. Many observers believe the pressure Baron and Brainerd brought against Nissan was significant in moving the car company to initiate the recall. 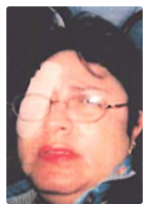 Because of a poorly designed sensor system, the air bag in Maria Gaytan’s 2002 Dodge Neon deployed unnecessarily and caused permanent damage to Gaytan’s right eye. To most people, serious injuries sustained in automobile collisions are usually associated with high-impact collisions resulting in severely damaged or completely destroyed vehicles. However, seemingly minor impacts can also result in debilitating injuries. That was the case for Maria Gaytan. In January 2004, Gaytan was involved in a collision near Hermiston that would be described by most people as a simple fender bender. After receiving a green light at an intersection, the vehicle in front of her accelerated but then stopped suddenly forcing Gayton to hit the back of it. Unfortunately, the airbag in her 2002 Dodge Neon deployed unnecessarily and with extreme force, crushing her right eye. 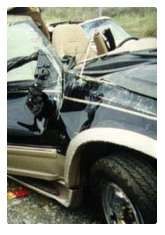 Gaytan was wearing her seatbelt at the time of the collision, and if the airbag had not fired during the crash, she would have suffered no injuries. Although damage to both cars was minimal, the damage to Gaytan’s eye was catastrophic. The unfolding bag slammed Gaytan in the face, smashing apart her glasses and rupturing the globe of her eye. After surgeons made every attempt to save the eyeball (vision was lost forever on impact), it was surgically removed and replaced with a prosthesis. With the help of Lawrence Baron, Gaytan filed a claim against manufacturer DaimlerChrysler for a defectively designed airbag sensor system. Experts retained by Baron reported the single point sensor system in the 2002 Neon was at the heart of the problem. The sensor not only ordered the airbag to fire late, it caused the airbag to launch despite the fact that the collision was not severe enough to warrant deployment. Baron’s experts argued that an effective sensor system should have sensors located at the front of the vehicle so that there can be early reception of a crash signal and a proper interpretation of it. DaimlerChrysler settled the case when Baron presented his evidence of the defective nature of the manufacturer’s airbag deployment system. Thanks to Baron's help, Gaytan received compensation for her medical bills and the permanent loss of her right eye. Ali Warsome supported the April 2003 recall of the airbags in the 1994 and 1995 Nissan Altimas. Ali Warsome fled his native country of Somalia for a better life in the US. Unfortunately, his life changed dramatically for the worse as the result of a car accident on April 28, 2002. On that day, Warsome was riding in a 1994 Nissan Altima and traveling from his home in Falls Church VA to Washington DC. He was headed to the bus station to visit his daughter in Minnesota. The driver, one of his sons, was attempting a sudden lane change when the car struck a traffic barrier. It wasn't much of a crash — the Altima didn't even need a tow, it was still drivable. However, the impact caused the passenger side air bag to inflate. The air bag struck Warsome's face with such force that his left eye had to be removed. Surgeons were unable to restore the vision in his right eye because – according to his medical records – "the retina was completely shredded." 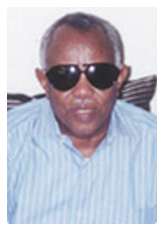 Ali Warsome lost his eyesight because of the impact of the air bag. "I cannot see the sky anymore," the 74-year-old immigrant told a reporter. "I cannot cook, I cannot walk, I cannot help my grandchildren.... I don't know what to do. "Warsome's Washington DC attorney, John F. Kennedy, brought Lawrence Baron in as co-counsel because of Baron's experience prosecuting the Altima air bag cases. Baron and Kennedy documented the defective operation of the airbag. They noted how at least 40 other individuals — riding as passengers in Altimas — had been blinded or otherwise suffered damage to their eyes as a result of the force with which the air bag strikes a passenger's face. Eventually Nissan agreed to an undisclosed settlement with Warsome. Warsome supported the April 2003 recall of the airbags in the 1994 and 1995 Nissan Altimas. He was featured in a Los Angeles Times newspaper article documenting the product defect just months prior to the recall. This was one of many pressure points applied to Nissan that eventually led to the car company’s decision to replace the air bags. Overturf v. Ford Motor Company and Bridgestone Firestone, Inc.
Natalie Overturf was injured when the right rear tire on her 1998 Ford Explorer blew out and the vehicle rolled over. A case was filed against Ford Motor Com. BaronLawFirm was proud to fully investigate and prosecute this case to a successful conclusion. William Day is thankful for Baron's determined approach to hold Winnebago responsible for its shoddy workmanship. Traveling with his wife in the couple’s motor home was an ideal lifestyle for William Day. Unfortunately, a dangerous manufacturing defect in his RV led to an unforeseen and seriously debilitating, accident. Day was injured in his Winnebago Itasca Meridian motor home during a 2004 trip to Arizona to visit his son-in-law. He was putting away shoes in a storage area under the bed in the Winnebago’s bedroom area when a heavy board – that held up the bed’s air mattress – fell on him, pushing him down on the floor and tearing the rotator cuff of his left shoulder. Day’s torn rotator cuff was the most severe his doctor had ever seen. Although Day underwent surgery to repair his injured shoulder, the shoulder never healed properly. “I’m still in a great deal of pain, and it just gets worse as I get older,” Day says. After asking the advice of workers at his local courthouse, Day decided to retain Lawrence Baron to bring a claim against Winnebago. During the course of the subsequent investigation, Baron discovered that the board that landed on Day was secured by only four wood screws. Also, the screws were most likely never tightened properly during assembly. When Day moved the board to gain access to the storage area, the board simply ripped loose of its foundation. This defect was only one of many plaguing the vehicle. During his brief ownership of the Winnebago, Day had to take it to the dealer, La Mesa RV in Portland, for numerous repairs. Many of those repairs, including several to the bed area in question, were proven by Baron to have been performed in a substandard manner. 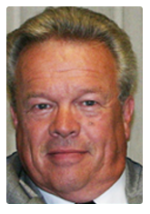 Baron visited many retail RV sales centers as he prepared Day’s complaint. He discovered that Winnebago’s competitors designed their storage areas differently. Other companies used additional screws and incorporated a safer design to ensure a secure connection between the board and its foundation. In fact, Winnebago used a different design in its other coach models. Upon being presented with this information, Winnebago decided to settle the Day’s claim. Day continues to enjoy being a “fulltime RVer” despite suffering from lingering pain in his shoulder. A former longtime Oregon resident, he now lives in Washington with his wife Karleen and takes pleasure in driving around the country.